PROBIOTICS are microbial products with live bacteria. They are used as dietary supplements and feed additives. Research has shown probiotics can effectively improve and enhance the level of beneficial bacteria in the intestine, thus preserving the health of human beings and animals alike. 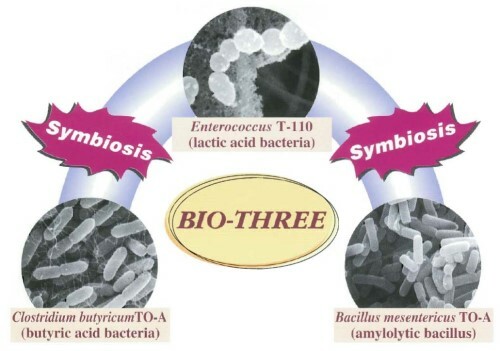 BIO-THREE is a probiotic researched, developed and manufactured by TOA Pharmaceutical Company of Japan since 1941. It contains three unique strains of bacteria which act in such a symbiotic mechanism that each facilitates the proliferation of the others.